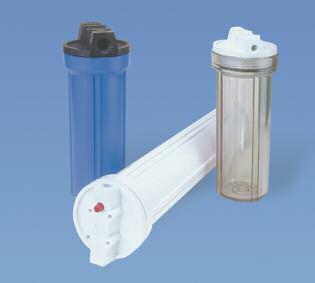 Top quality and economically priced plastic filter housings (with and without pressure valves). • Full product line with various types, models, pipe fittings and options. • Heavy duty construction, made using high quality FDA grade polypropylene. • Superior chemical resistance from many aggressive chemicals. • Buttress thread design for superior sealing and security. • Temperature rated to 125°F (52°C). • Pressure rated to 125 psi (8.75 bar). • Cap, sump and top-seated o-rings compress to provide leak proof sealing. • NSF Standard 42 certified (FH4200WW14, FH4200BB14, FH4200WW34). Click here to check Flowmatic® filter housing dimensions. FH500WW14 5" No White White 1/4"
FH500WW12 5" No White White 1/2"
FH500CW14 5" No Clear White 1/4"
FH500CW12 5" No Clear White 1/2"
FH4200CW14 10" No Clear White 1/4"
FH4200CW14PR 10" Yes Clear White 1/4"
FH4200CW38 10" No Clear White 3/8"
FH4200CW38PR 10" Yes Clear White 3/8"
FH4200CW12 10" No Clear White 1/2"
FH4200CW12PR 10" Yes Clear White 1/2"
FH4200CW34 10" No Clear White 3/4"
FH4200CW34PR 10" Yes Clear White 3/4"
FH4200NP34 10" No NP NP 3/4"
FH4200WW14 10" No White White 1/4"
FH4200WW38 10" No White White 3/8"
FH4200WW12 10" No White White 1/2"
FH4200WW12PR 10" Yes White White 1/2"
FH4200WW34 10" No White White 3/4"
FH4200BB14 10" No Black Black 1/4"
FH4200BB34 10" No Black Black 3/4"
FH4200BL14 10" No Blue Black 1/4"
FH4200BL14PR 10" Yes Blue Black 1/4"
FH4200BL38 10" No Blue Black 3/8"
FH4200BL38PR 10" Yes Blue Black 3/8"
FH4200BL12 10" No Blue Black 1/2"
FH4200BL12PR 10" Yes Blue Black 1/2"
FH4200BL34 10" No Blue Black 3/4"
FH4200BL34PR 10" Yes Blue Black 3/4"
FH7000WW38 20" No White White 3/8"
FH7000WW38PR 20" Yes White White 3/8"
FH7000BL38 20" No Blue Black 3/8"
FH7000BL12 20" No Blue Black 1/2"
FH7000BL12PR 20" Yes Blue Black 1/2"